Upload your photos and print onto custom beach towels that you design. Create one as a gift or one for you. Use your favorite images or names to create personalized beach towels. Express delivery. Ideal for a day at the beach or a trip to a water park, our custom beach towels are perfect for summer or vacation use. Soft to the touch and easy to pack, our personalized beach towels are customized using your images, text, and designs. Simply create a beach towel in our easy-to-use online system. Plus our custom beach towels are long-lasting, quick-drying and the print won't fade with time! We all liked the towel and printing. Communication was good. Very prompt postal service. Thank you for a good product. Have ordered towels with a photo printed. Pictures is super clear, delivery quick and ordering easy! Only doubt I could have is about life spam of the photo when washing the towel. But overall very happy with it. If you want your personalized beach towels printed on both sides with super thick extra luxury feel, we can print a second layer and have it sewn together so you have images front and back for added luxury. This is a little extra cost but double the value. Double thick and double printed is available on any size of our towels. Create your own custom beach towels online using your own images or designs. To begin press start design, and from there you are able to upload graphics and images, change colors, and add text. Once your design is complete, we print your design directly and deeply into the towel's fibers. Thanks to our sophisticated printing methods, your image will last years. Enjoy your new printed beach towels at the pool or at home, too! They are funky, great fun, and handmade too. Your beach towels are quick drying and easy to pack so ideal for traveling, hiking, or at the gym. Water and oils are quickly absorbed thanks to the microfibers, and because the towel is quick drying it is less prone to stale than natural fibers. The towel is light for easy carry and is machine washable. A very useful towel in a variety of situations and if you personalize it that's even better. Start designing your custom microfiber towel now. Care: These beach towels will last years and years and will age very well. The ink is long-lasting and fused to the fibers of the textile so will not peel or crack off. Wash up to 86 deg F, drip dries fast. Guaranteed: Two-year guarantee on print, material and stitching finish. If you'd only like one, that's just as easy. There's no minimum order amount with our beach towels. Your personalized beach towels are digital-printed and fabricated one at a time. Made from super soft toweling material, this fabric has a pile that, when pushed in one way shows your design, and pushed the other way also shows your design but with small flecks of white textile deep down in the fibers. The flecks are minimal and are a natural occurrence of toweling fabric. The edges of your custom beach towels are hand hemmed for a handmade touch of quality. These tolerances are entirely acceptable and do not render the item less loveable. Printing all over towel material is extremely hard to do - and we do it well. We have optimized the printing on towel textile to ensure balance for the best print and thickness, and we have years of printer experience. We are probably making the best all over printed beach towels available worldwide. After printing, the towel feels a little flat and then fluffs up with use. It soaks up more water, towel weight for weight, than conventional towels. Add a picture on a towel or even a photo montage of your last Canada holiday. 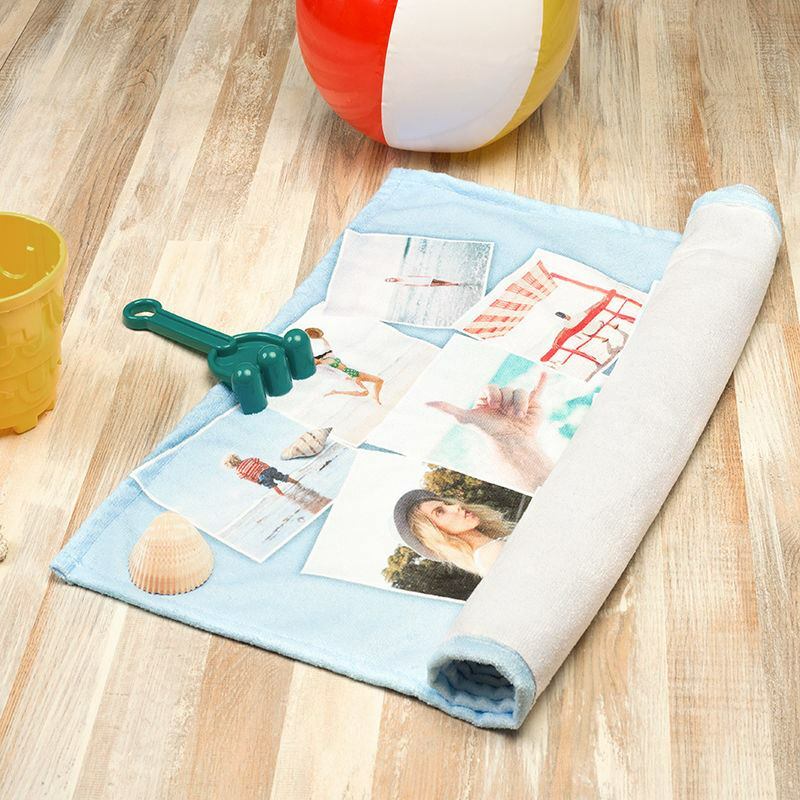 The simplest way to create your custom beach towels is to print it with one photo. They look great especially on the double size towels, and so do photo collages. This popular and simple use of this product makes it a great photo gift. We love to produce them and photo beach towels are fun to make, fun to give and fun to use. Try out our preview design tools to see what yours could look like. There's also no minimum order amounts for our towels, meaning you can create as many or as little as you'd like. To fully enjoy your personalized beach towels, we suggest washing it before you first use it, which will make it even softer against your skin. To make sure your towels are functional as well as fashionable, we make them using Microfiber, which absorbs water brilliantly and dries quickly. To ensure you are thrilled with your print, please create a design using a photo montage or a detailed print, rather than plain colors. Our printing methods will really make these kinds of designs pop. These bespoke beach towels make unique gifts and come in children's and adult sizes and you can even print with names on too.